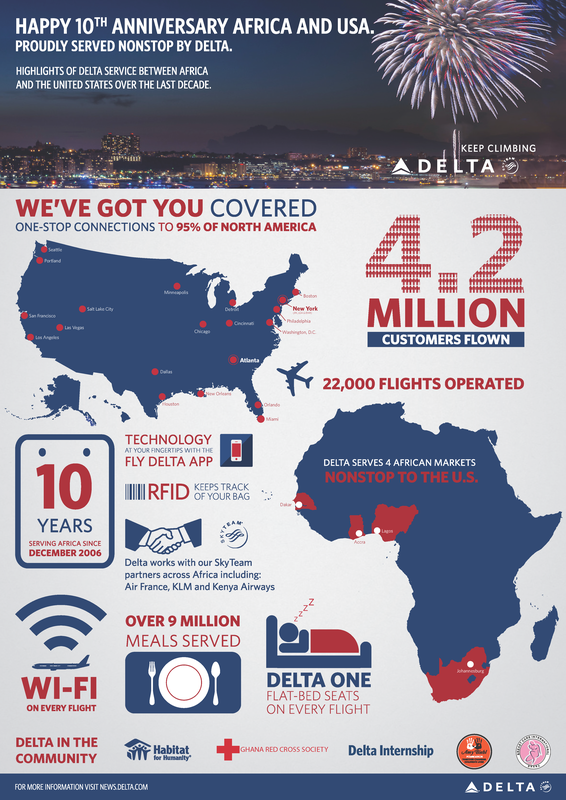 Delta has been leading the way in travel between the United States and Africa for the past 10 years. The airline launched flights to Ghana, Senegal and South Africa in December 2006 and a year later, added Nigeria to its route map. Fast-forward to now, and almost 5 million passengers later, the airline offers a wide range of connections between Africa and North America via its Atlanta and New York-JFK hubs. In becoming the first U.S. carrier to fly to sub-Saharan Africa since Pan Am in the 1980s, Delta has dramatically cut travel times, allowing customers to fly straight to the U.S. without connecting via Europe. With time at a premium for business travellers, same-day connections can make all the difference when booking flights. The advent of Wi-Fi means customers can stay connected while in the air but that does not compensate for time on the ground. Delta’s service to Africa has played a pivotal role in driving economic growth with especially strong demand from travellers in the oil and gas, financial services and commodity trading industries. And while competition is growing, Delta’s early commitment to Africa means it has become part of the landscape in key markets – a position it’s strengthening by improving its service to its customers. “Delta’s nonstop service to the U.S. from Africa makes it much easier for American companies to do business in Africa,” said Brent Omdahl, Commercial Counselor - US Embassy Nigeria. Delta has improved its services by opening a new departure gate and business lounge at Accra’s Kotoka International Airport and a Family Plus service at Dakar airport, where agents assist families through check-in and boarding, in addition to a children’s area in the gate area to keep younger travellers occupied. Delta is also refining its on-board dining experience across its network. Highlights include a new selection of chef-created menus that use ingredients picked at their seasonal best. Menus are tailored to the preferences of local customers with those from West Africa offering rice-based dishes, replacing pasta, while a wider selection of fruit juices are on offer. Delta partners with local organisations to support communities in Africa. In 2016, CEO Ed Bastian announced that 1 percent of net income would be provided to carefully selected charitable projects each year. In Ghana, Delta has partnered with the Ghana Red Cross Society for four years to support the “Hang Up and Keep Up” malaria prevention programme. This funds mosquito nets for pregnant women and under-fives, as well as training for field volunteers. Plus, Delta recently announced a partnership with Breast Care International to fund the Community Outreach programme to rural communities that helpsr women to be educated about breast cancer and clinically screened. Through its partnership with Habitat for Humanity, 40 Delta employees completed a build near Kumasi, Ghana, while in South Africa, Delta is a supporter of the Amy Biel Foundation that works with under-privileged youth in local townships. Delta’s Business Internship Program, meanwhile, is now in its fifth year. Operating in Nigeria, Ghana, Kenya and Senegal, it provides an opportunity to work alongside Delta sales teams in each country. The participants learn about business within a large global organization before visiting the airline’s Atlanta HQ. Looking ahead, Delta will continue to work with its joint venture partners to extend the travel options for customers across Africa and maintain its commitment to offering exceptional customer service and operational reliability. June 2009: Delta launches first nonstop between South Africa and the U.S.